A small hint for your installation with Juniper gear. We faced a very interessting situation with two EX4200 in virtual chassis setup. The following behaviour can drive you crazy:analyzing the optical parameters of a SFP+ straight on the Interface is fine. after activation of Virtual Chassis and keeping the wiring as before you can't access the transceiver parameter no longer from the interface directly (since JunOS 12.3 R3 possible again). To gather the diagnostic values you have to use the Virtual Chassis port. More interessting is the fact that somehow "gremlins" added an imaginary attenuator of 20dB into the link although the phyiscal setup wasn't touched! To find a proof for the 20dB delta we added an attenuator of 10dB to our back-to-back link. With this attenuator we were able to reproduce this pattern (our tests were done with 5dB and 15db as well). 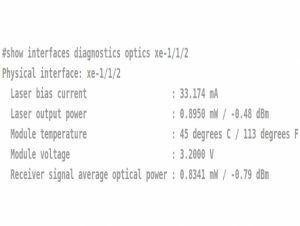 Looking as a software developer the decimal mWatt value of "Receiver signal average optical power" is shifted by two digits. Actually this is the problem. In the field people use Dezibel rather than mWatt. Just keep a 20dB Offset in mind. Update: with JunOS 12.3 R3 you can get the diagnostic values directly from the inteface again, even when the switch is in virutal chassis config. And hurray, the values are correct. This is still happening with JunOS 12.3R3.4 and 10G LRM optics P.1396.2M-JUN02. All receiver related number both measurements and thresholds moved by 20dB. On 12.3R6.6 I am seeing received power scaled the other way, received power 1.0767 mW / 0.32 dBm where the transmitted power at the other end is 0.6450 mW / -1.90 dBm. No way 80 meters of OM2 has 2.22dB gain.